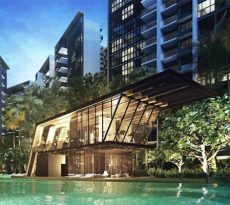 Located along 28 Beach Road right at the heart of the buzzing District 7, Singapore, South Beach Residences is an upcoming luxury mixed development that’s made for the most discerning tenants and investors. The prestigious development features a modern design that perfectly blends in with the old school yet iconic 1930 conservation buildings. South Beach Residences houses a total of 190 luxury units occupying a staggering 510,000 sqft in space. South Beach development block majestically sits in the prime downtown Singapore area. 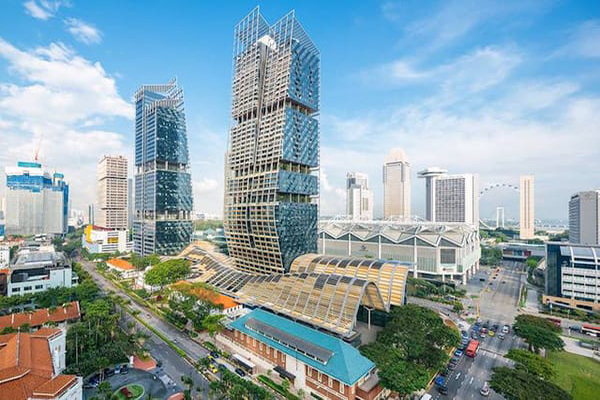 And it happens to be one of the structures shaping Singapore’s skyline alongside the iconic Marina Bay Sands, the glorious Suntec City and the charming Esplanade theatre. The development also brings together a number of upscale shops, cafes, restaurants, hotels and public places, making it a true paradise where you can live, work and play. The South Beach residences’ glaring and heat deflecting glass design offers residents the best in terms of looks and comfort. The monumental wave-like canopy below also captures the wind and directs air flow to cool the development’s ground spaces. This guarantees residents of ultimate comfort in the urban amid the extreme tropical climate that typifies Singapore city. The 190 lavishly built South beach residential units are found between the 23rd and the 45th floor of the South Tower. The residence consists of 88 2-bedroom units, 58 3-bedroom units, 35 4-bedroom units and 6 penthouses. All these units offer unparalleled views of the Marina Bay, the Historic and Civic district as well as bird’s eye view of the general lush cityscape. Travelling will never be a hassle for residents of South Beach, thanks to the detailed transport network connecting the city and parts of the island. The Esplanade MRT is at the development’s doorstep; just 2 minutes walk away. City Hall MRT station is also within a few minutes’ walk from the residential, making the process of getting around the city even more convenient. 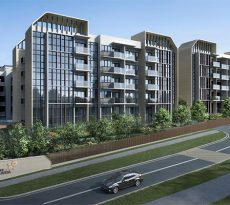 Furthermore, South Beach development is well-connected with a number of expressways including East Coast Parkway (ECP), Central Expressway (CTE), Ayer Rajah Expressway (AYE) and Kallang Paya Lebar Expressway (KPE). Other ancillary roads also come in between, which makes accessing the neighborhood an extremely easy affair. 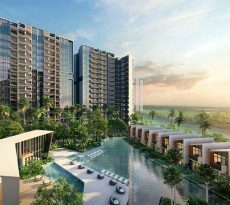 And what’s more, the Changi Airport is less than 30 minutes away from the development, so residents have an easy �escape route’ from Singapore. Future residents of South Beach will enjoy the convenience of having multiple shopping centers right at their doorstep. Some of the notable shopping malls available nearby include the Suntec City Mall, Marina Square, Shwa Leisure Gallery, Raffles City, Peninsula Shopping Center, Funan Digitalife and many others. South Beach Residences also happens to be located in close proximity to a number of food centers such as Albert Centre, Gluttons Bay, Golden Mile Food Centre, Berseh Food Centre, Chinatown Market & Food Centre and People’s Park Complex Food Centre. This makes shopping for foodstuffs and groceries both convenient and fun. Considering South Beach Residences’ location in the city, it is fairly obvious that its future residents will enjoy convenient access to schools ranging from elementary all through to university. Some of the schools located within a distance of 1 km include Rosemary Kindergarten, PCF Kampong Glam Blk, Singapore Management University and Nanyang Academy of Fine Arts. There are other schools found within a distance of less than 3km like Stamford Primary, Outram Secondary, Catholic JC and St. Marget’s Primary. The strategic location of South Beach Residences within the city offers access to countless recreational parks and hang-out spots that will make life for residents even more rewarding. The Kallang Riverside is a tiny distance from the development and offers amazing facilities including a jogging track, cycling track and outdoor fitness equipment. Those who are in love with water sports can visit the Kallang Riverside Park for weekend and holiday outings. The park also has lush greenery and a serenity that connects people to nature even as they unwind. Residents can also visit other nearby parks like Esplanade Park, War Memorial Park and the Fort Canning Park. Based on South Beach Residences location at the heart of District 7, the prices for the residential units (in terms of psf) are obviously going to be highly attractive. Be sure to check the actual prices that will be released by the developers in the run up to the launch. The process of hunting for a home in Singapore is sometimes long and tiring. But if you put your trust in iCompareLoan mortgage broker, you’ll be able to compare home loan Singapore and choose a package that will suit your home purchase needs. The good thing about this firm is that it’s been around for many years and charges absolutely nothing of its first-rate services. So whether you are applying for a new loan or soliciting a refinance, you can be assured of getting the home loan in an effortless and timely manner.